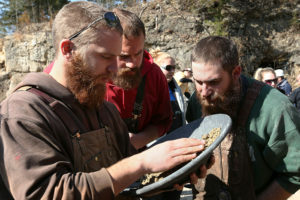 Brent Fremont (left) sifts through the gold pan as his teammates Mike Allen (center) and Matt Coy help him search on Saturday, April 5. Photos by Sam O’Keefe. Men’s and women’s teams from Missouri University of Science and Technology won world championships in mucking last weekend. The last time both teams won first place was in 2005. The teams placed first in their respective divisions at the 2014 Intercollegiate Mining Competition, which was held April 2-6 in Rolla. Another women’s team from Missouri S&T also won second place. The event brought 42 teams from the United States, Australia, Brazil, Canada and the United Kingdom to Missouri S&T’s Experimental Mine Facility for the competition, which featured events based on mining techniques used in the late 19th and early 20th centuries. Students competed in timed events like gold panning, surveying, hand-mucking, hand-steeling, track-standing, Swede sawing and jackleg drilling. Seven teams from Missouri S&T competed in the event. Lindsay Miller (left) reacts to the results of Deanna Fitzergerald’s effort in the jackleg drilling event on Friday, April 4. Missouri S&T women’s teams also won first place in 2007, 2009, 2011 and 2012. Matthew Coy, a Ph.D. student in mining engineering from Lewistown, Mo. Brent Fremont, a junior in mining engineering from Edwardsville, Ill.
Molly Clement, a senior in mechanical engineering from Souderton, Pa.
Deanna Fitzgerald, a senior in mining engineering from Salisbury, Mo. Kelsey Garrett, a senior in mining engineering from Wildwood, Mo. 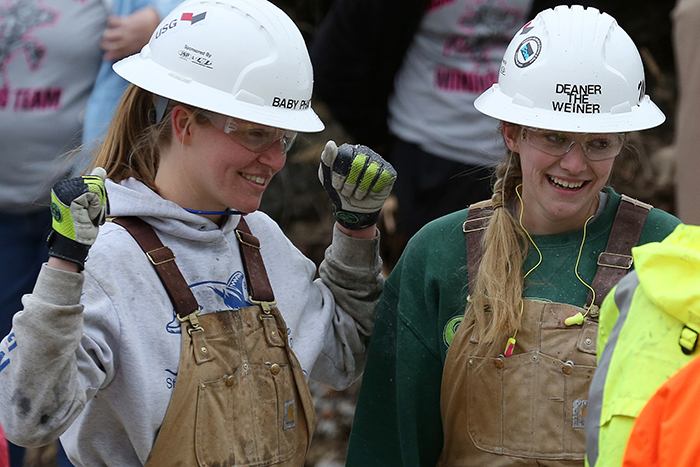 Elizabeth Hunt, a senior in petroleum engineering from Chugiak, Ala.
Lindsay Miller, a senior in petroleum engineering from St. Peters, Mo. Abby Pfaff, a sophomore in mining engineering from Ste. Genevieve, Mo.